Turn off SNAP, ORTHO, and OSNAP modes by clicking their respective buttons on the status bar until they look dimmed. Select the Hatch layer from the Layer drop-down list at the bottom of the Layers panel on the Home tab. On the Home tab’s Draw panel, click the Hatch button — the one that shows the fine crosshatching inside a square. The Hatch Creation tab appears on the Ribbon. Note that the Ribbon now has a light green bar at the bottom and that all the panels now show actions related to creating and formatting hatch. On the Hatch Creation tab’s Pattern panel, click the Hatch Pattern button and select ANSI31. Then adjust the hatch scale. Depending on the screen resolution, the panels may show more or less information. You may see an ANSI31 swatch without having to click the Hatch Pattern button. Move the crosshairs over the drawing objects. Pick internal point or [Select objects/Undo/seTtings]: Move the crosshairs so they’re between the inside and outside edges of the column. Zoom in if you need to get closer. 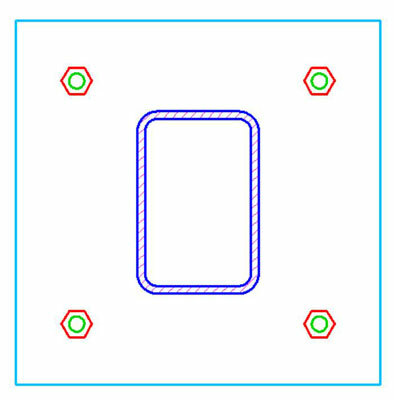 The live preview shows the ANSI31 hatch pattern filling the space between the two filleted rectangles. Live preview not only shows you the pattern but also lets you preview the hatch angle and scale. In this case, it looks like the hatch pattern may be too fine. In the Scale box of the Hatch Creation tab’s Properties panel, change the value to 5 and press Tab to confirm it. Move the crosshairs back to the area between the two filleted rectangles to preview the hatch again. If it looks okay, click within the hatched area to confirm the hatch object, and then press Enter to finish the command. Perfect! But suppose that the nutty engineer has decided that the column needs to measure 18 x 18 inches rather than 12 x 18 inches. Therefore, the base plate is too small, and the anchor bolts are in the wrong place. If you were drafting from paper on the drawing board, you’d pull out the eraser right about now to rub out all your efforts — and if you were lucky, you’d have an electric eraser. At some point, you simply tore up the paper and started over, or labeled the appropriate dimensions as NTS (Not To Scale). It’s AutoCAD to the rescue.